Amsterdam loves its many artists, creatives, self-employed craftsmen and women and companies. But the price of housing and workspace is soaring. To make sure that young, creative talent still finds a home in the city, Amsterdam has created their system of ‘broedplaatsen’: breeding spaces or creative urban incubators. The breeding spaces of Amsterdam consists of disused and neglected buildings. Here, independent artists, entrepreneurs and start-ups can rent cheap workspace to work, meet, share ideas and collaborate. Many of them also open trendy bars, restaurants and club nights where hip Amsterdam finds its way to party. And because these have special licenses, partying can go on until the early hours of the morning. Below you will find a list of the Broedplaatsen in Amsterdam that are open to the public. You can find them also on the map. Further below you will find information on how to apply for cheap rental workspace in a Broedplaats in Amsterdam. At the moment (2017), there are 50 Broedplaatsen in Amsterdam. Below is a list of the Amsterdam breeding spaces that are open for visitors and have bars, restaurants or organise events. Always check to see what is going on the agenda at the website or their facebook page as that is usually more up-to-date. Vrijplaatsen, ‘Free Spaces’ or ‘free havens’ are disused areas and buildings that were squatted. Squatting took place mainly in the 1970 and 1980’s, when there were a lot of empty buildings and a huge shortage in housing in Amsterdam. In the 1990s, the Amsterdam council offered them deals and many of them now have legal status. The difference between Vrijplaatsen and Broedplaatsen is that Vrijplaatsen receive no government funding at all. They are completely independent and often have a anarchist mentality and ideology. The broedplaatsen in Amsterdam nearest to centre are named first. Vrijplaats. Art gallery. Located in a squatted theatre, squatted in 1979, now legalised. Mediamatic is a very active organisation that programs activities like lectures, workshops and art projects and installations about nature, biotechnology and art/science. Restaurant and bar Mediamatic ETEN is located in a greenhouse on the waterfront of the Eastern Docklands, facing NEMO Science Museum, with great views and a sunny terrace. Former cold war bomb shelter (!) under the viaduct of the Vondelpark with bar and events. OT301 is not easy to find! Here’s is what the front door looks like. OT301 is a former film academy building squatted in 1999. The large building (4 floors) holds many tenants and organisations that work together in a collective. There is a concert hall and studios for concerts, theater, performance, dance and workshops, an art gallery, there is a cinemaand an upstairs bar. On ground floor there is the vegan restaurant Peper. Peper offers 10-euro meals. OT301 is popular among a young international backpackers scene. Check OT301 agenda for events. Located at Overtoom 301. Former shipping warehouse along the banks of the IJ, Pakhuis De Zwijger offers a daily program of lectures and debates about urban development, innovation and social themes. There is also a bar and restaurant/bistro. Another former shipping warehouse along the river IJ, former squat is Pakhuis Wilhelmina. It now houses over 100 ‘broedplaats’ workspaces. Also hosts the popular Mezrab storytelling nights. Cinetol offers creative workspace in the south side of De Pijp neighbourhood for creatives. Cinetol is also a venue for live music, film and offers cultural events. There are also (music)studio’s and rehearsal rooms. De Tol bar has a terrace outside. Located at Tolstraat 182, De Pijp. Former newspaper building of De Volkskrant has been turned into a huge, professionally organised and successful Broedplaats. All thanks to the Amsterdam Urban Resort organisation that has set up and runs another 14 broedplaatsen in Amsterdam. The hip Amsterdam Volkshotel has 172 hotel rooms to offer. Canvas is the popular bar, restaurant and club. Urban Resort VKG is located at Wiboutstraat 150, easily reachable by metro. Lola Lik: Art, refugee aid and urban farming at former Bijlmerbajes. From January to December 2017 Lola Lik was a Broedplaats Amsterdam in a very special location: the former prison of Bijlmerbajes (H.J.E. Wenckebachweg 48. Next door to Lola Lik is the asylum seekers centre (AZC), with room for 600 refugees. Lola Lik worked in co-operation with the centre and its inhabitants to facilitate their integration in society with work and education. Lola Lik is now closed. Still open however is the restaurant A Beautiful Mess and the Movement Hotel. 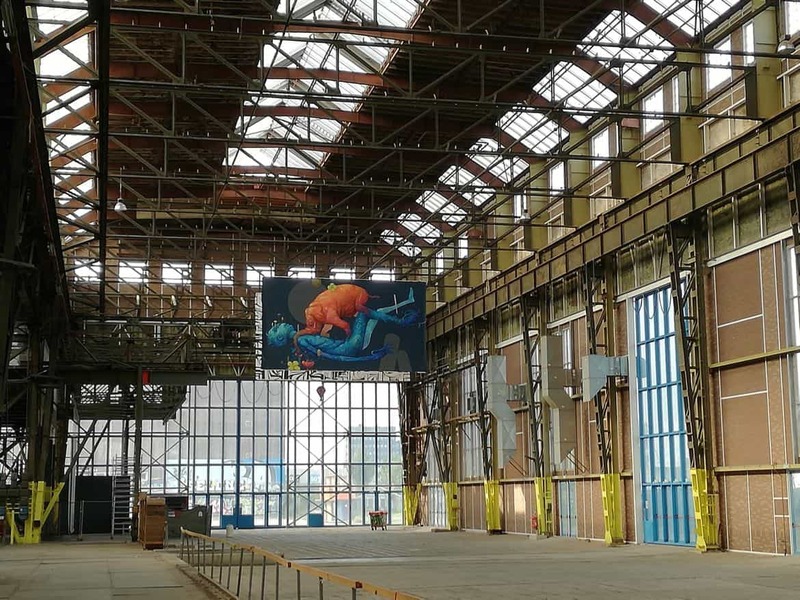 NDSM is a former shipyard with hundreds of work spaces for entrepreneurs. On the grounds are bars, clubs and restaurants. Take the free ferry behind Central Station to NDSM. Shipping containers used as artists work spaces at NDSM. Former shipyard De Ceuvel is creatively renovated with on shore houseboats and a lively ideology on sustainability that is being practised at the spot. Hip Amsterdam bar and restaurant/bistro. Also holds festivals and events. Zaal 100 is a Vrijplaats. De building is a former school in Amsterdam West. Apart from work studios there is a stage for music, a bar and a restaurant with meals for 10 euros (not every day and only on reservation). Alternative, older crowd. Improv jazz every Tuesday. Located at Wittenstraat 100 (Staatsliedenbuurt, Amsterdam West). Check programming at Zaal 100. At the former Frederik Hendrinkschool there is also a vrijplaats. The squat is legalised. Houses the popular bar De Nieuwe Anita with a small stage for regular live music in the basement. Every Friday and Saturday live music, dj’s and cocktails, entrance fee, open till 2.00. Located at Frederk Hendrikstraat 111. De Nieuwe Anita. Breeding Space ‘Het Sieraad’, with café and restaurant Edel on the waterfront. Monumental building from the Amsterdam School years (Het Sieraad ‘ The Jewelry’, from 1924)) hosts not only working spaces for creatives, but also a popular Friday night party organised by Edel, the downstairs bar and eatery with large terrace. Young crowd. Het Sieraad, Postjesweg 1, Baarsjes. Podium Mozaik is located in a former church. Podium (‘stage’) Mozaïek is located in a rather unusual church, the Pnielkerk from 1954. The stage hosts a diverse, multi-cultural program of theatre, cabaret, dance, music, spoken word etc. With bar and restaurant. Podium Mozaïek, Bos en Lommerweg 191, Amsterdam Nieuw-West. WOW is actually a hostel. It also offers work studios for graduates from Amsterdam’s art institutes. It programs all kinds of activities, performances and festival. The large downstairs area offers a bistro and is a good area to use your computer and work (for free). WOW, Wiltzanghlaan 60, Amsterdam Nieuw-West. Broedplaats VLLA is located in a former funeral home in Amsterdam Nieuw-West. If that isn’t cosy enough, on Fridays and Saturdays they hold intimate jazz or pop concerts. Also festivals, theatre, dinners with live performance and dance parties. Nice cosy space with outside area. Young crowd. VLLA, as they say on the website: hard to find, easy to love. Located at Willem Roelofsstraat 9. It’s not the most far-off Broedplaats, but it’s not especially around the corner either: 1800 Roeden, at the edges of urban Amsterdam. The grounds and buildings were actually used to store ammunition. The 1-hour bike ride is worth it, because of their eatery Rijk van de Keizer / De Cantina. A great summertime hangout in Amsterdam. And the artists around are friendly enough to show your around. ADM, the Free haven of alle free havens in Amsterdam, located in the Amsterdam harbour industrial area on a former ship yard. Famous for its Burning man-like events. Sadly, after 20 years, the end of ADM is near. Probably closing as of 2018. Ruigoord was an small village near Amsterdam with a charming little church. In the 1960s the village was evacuated because of the arrival/extension of the Amsterdam West harbour. Soon after, it was squatted by hippie artists. They created their own little free village, similar to Denmark’s free town of Cristiania. Ruigoord is now full-on legalised. On sight there are many work spaces for artists. Ruigoord also has an extensive cultural program that is centered around its church. Parties are usually on Friday and Saturday. On Sundays there are live performances. In summer there are many dance festivals. The area is a nice bike ride away, but your can also easily get there by bus 382 which leaves from Sloterdijk trainstation. You are free to roam around the village. Check Ruigoord website for program. The WG-terrain is a huge area with different buildings, surrounded by parks and green gardens with awsome trees. All these buildings belonged to a complex of hospitals, the Wilhelmina Gasthuis. It’s slightly hidden in Amsterdam Oud-West in what looks like a well-off residential area. Now, these grounds are part of a broedplaats that offer housing (80) and working (35) spaces for artists and start-ups. There is also practice space available for if you’d like to start your own yoga-course (or something). There is also a café (WG Café) an art house cinema and art gallery: Lab111. Lovely, quiet area to walk or bike wander around. Another successful project of Urban Resort, the renovation of a former dentist buildings ACTA into artist work spaces. With a hip Amsterdam club Radion, eaterie and a stage. Located at Louwesweg 1, Amsterdam Nieuw-West. Free parking. A free haven (Vrijplaats) at a former military complex. Squatted and used by a group of artists and crafts people. Famous for its party on Hemelvaartsdag (Day of ascension, 10 days before Pentecost). The Broedplaatsen policy of Amsterdam started in 2000. Since then the Amsterdam council has spent 46 million euros to create these creative incubators, all across the city. Thousands of studios, offices, project and exhibition spaces, stores, studio dwellings and commercially run bars and restaurants are now housed in old schools, warehouses, industrial dwelllings, laboratory, offices and the former Amsterdam prison. Every year, a special bureau of the city council, Bureau Broedplaatsen, creates over 10.000 m2 of new space for artists each year. A Broedplaats is always temporary and lasts for 3 to 10 years. Studios and workspaces of Broedplaatsen are about 300 euros a month (excluding water, electricity etcetera). To apply for an artist studio in a new Broedplaats, the Amsterdam government does the assessment, carried out by the Committee for Studios and Living/ Working Spaces (CAWA). They look at the type of creative profession, education, recent work, stipends and so on. Also, your income must not exceed the limits for social housing (about 30.000 a year). As a basic ‘CAWA creative’ you can rent a studio for a period of up to 5 years. Existing Broedplaatsen have their own approach and policy, it’s best to ask at the Broedplaats if there is space available and how to apply. All available work and living spaces in Amsterdam and all Amsterdam Broedplaatsen you can find here: https://www.amsterdam.nl/kunst-cultuur/ateliers/. Everyone may start a Broedplaats. You found a suitable area? Lucky you. Bureau Broedplaatsen can help you with funding and set up. More information at Loket Broedplaatsen, 06 5399 6719 or email: broedplaats@amsterdam.nl.